Note: If you haven’t already done so, then take a look at the Twilio Video Android QuickStart Application. Once you've played with the QuickStart, come back to this guide for more detail on how to add video to your own app. If you’ve worked with WebRTC in the past, you’ll find that Programmable Video provides a simple wrapper around WebRTC’s lower-level APIs to make it easy to build rich audio and video applications. You can still access lower-level primitives, but that’s not required to get started. Additionally, Programmable Video provides the missing pieces required to use WebRTC to build sophisticated applications: Global STUN/TURN relays, media services for large-scale group conferences and recording, and signaling infrastructure are all included. A Room represents a real-time audio, video, and/or screen-share session, and is the basic building block for a Programmable Video application. In a Peer-to-peer Room, media flows directly between participants. Supports upto 10 participants in a mesh topology. In a Group Room, media is routed through Twilio's Media Servers. Supports upto 50 participants. Participants represent client applications that are connected to a Room and sharing audio and/or video media with one another. Tracks represent the individual audio and video media streams that are shared within a Room. The following code samples illustrate common tasks that you as a developer may wish to perform related to a Room and its Participants. The Android SDK supports Android API level 16 and higher. It is built for armeabi-v7a, arm64-v8a, x86, and x86_64 architectures. Watch the video-android project on Bintray to get notified of all future releases. to authenticate to the REST API. Audio and video options, which when enabled will create and publish audio and video tracks from your local camera and microphone to the Room immediately upon connecting. Local audio or video tracks, to begin sharing pre-created local media with other Participants in the Room upon connecting. An ICE transport policy, which allows you to force calls through TURN relay for testing purposes. A log level for debugging. The name of the Room specifies which Room you wish to join. If a Room by that name does not already exist, it will be created upon connection. If a Room by that name is already active, you'll be connected to the Room and receive notifications from any other Participants also connected to the same Room. Room names must be unique within an account. You can also create a Room using the Rooms REST API. 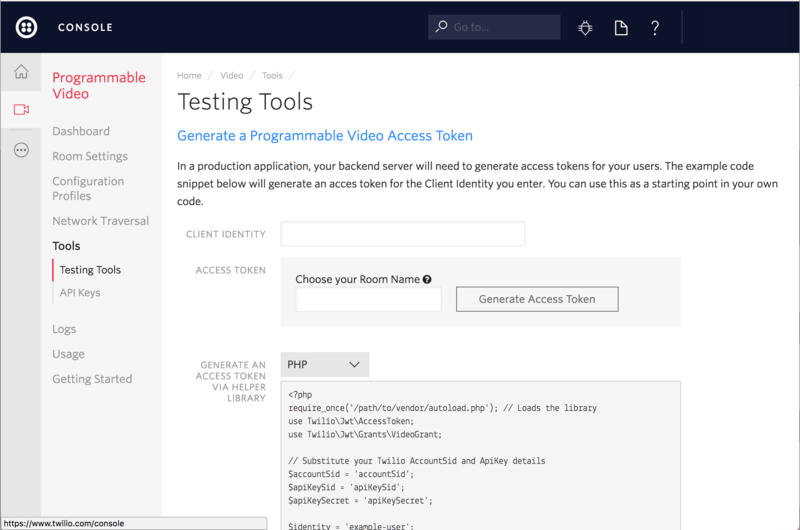 Look at the REST API Rooms resource docs for more details. Note: If you don’t specify a Type attribute, then Twilio will create a Group Room by default. Note: Twilio will set the Room Type as Group by default on the Room Settings page. In an Android application, begin capturing audio data by creating a LocalAudioTrack, and begin capturing video by adding a LocalVideoTrack with an associated VideoCapturer. The Android Video SDK provides customizable video capturers for both camera and screen capture. As the client joins a Room, the client can specify constraints such as the camera source, specific tracks to be added to the room, size of video etc. Take a look at the attached code examples. When you join a Room, Participants may already be present. You can check for existing Participants in the connected event callback by using the participantsgetter. You can disconnect from a Room you're currently participating in. Other Participants will receive a participantDisconnected event.